Vinyl die has been used by the PC Case Modding community for a long time now, I’d be willing to bet this is much the same stuff, and probably cheaper since car variants of products invariably carry additional margins. Julian, what I like about your blog about tweaks and mods is that they are practical, and cheap. Being someone that owns old(er) cars myself, keeping the body trim neat and tidy is always good so that the old car doesn’t look more grey and worn than it really is! That’s a top find, I will have to invest in a bottle of that for my mirrors – Unless I just repaint them to match the car. In the past, I always just used some plastic primer then black spray paint to do this job, but it doesn’t last forever and this is probably much better for anything forward facing as it won’t chip. I’ve always used plain black shoe polish. It’s worked wonderfuly on my last 2 cars, and have never had problems with it. I have a motorbike with a similar problem. Can you tell us where you got the product from. The local auto parts shop. I’m w/ Wayne here: Just going back to the late 70’s/early 80’s, bumpers were mostly steel w/ a chrome finish. 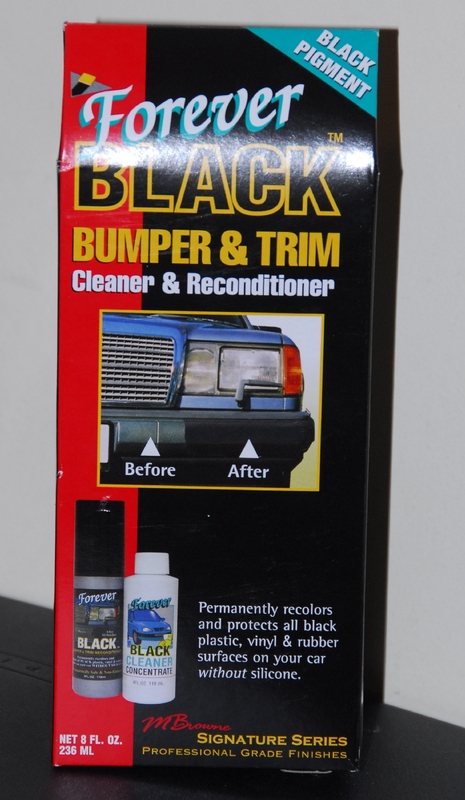 This product definitely aids in the newer-style bumpers that gets a bit shredded w/ literally a 5MPH “bump” per say. I’m looking forward to purchasing this for my black ’03 Ford and seeing those frayed gray strips on my front bumper!